After wrapping up a summit closely watched by the world, the leaders of South and North Korea and their wives attended a dinner banquet featuring symbolic music and carefully selected dishes at the truce village of Panmunjeom on Friday evening. 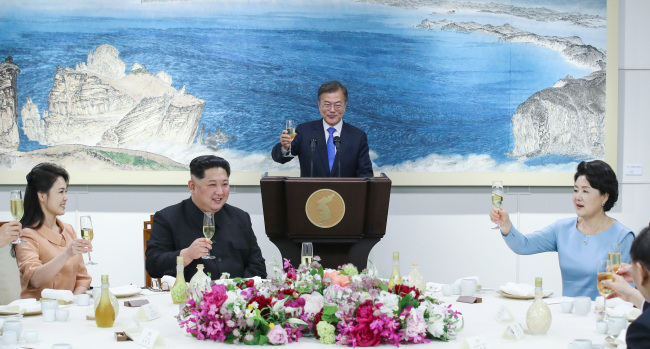 The banquet took place on the third floor of the Peace House, where the inter-Korean summit had taken place during the day, according to South Korea’s presidential office Cheong Wa Dae. President Moon Jae-in and first lady Kim Jung-sook extended a warm welcome at the door to North Korea’s leader Kim Jong-un and his wife Ri Sol-ju, who had crossed the border at 6:18 p.m. to attend the dinner event. Upon entering the building, the four briefly chatted and took part in a photo session before entering the banquet hall. 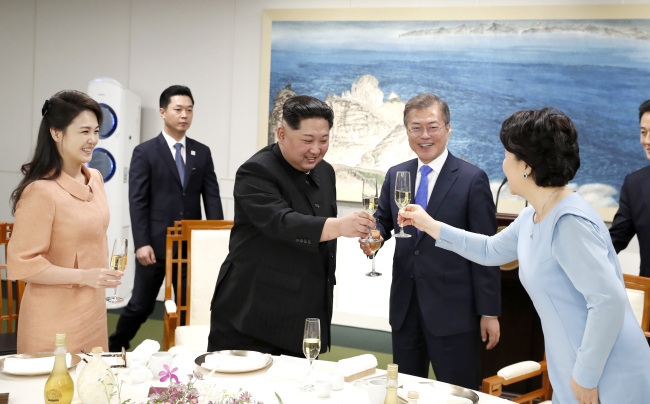 A total of 26 people from the North attended the banquet, including the North Korean leader, his wife, as well as his sister Kim Yo-jung, who was seen closely accompanying the leader throughout Friday’s summit. Kim Yong-nam, the North’s nominal head of state and president of the Presidium of the Supreme People’s Assembly, Hyon Song-wol, director of the Samjiyon Orchestra, and six of the nine bodyguards who had accompanied the North Korean leader were also at the dinner event. From the South, a total of 32 people including the president and first lady, Rep. Choo Mi-ae, chairwoman of the ruling Democratic Party of Korea, Culture Minister Do Jong-hwan and Korea Chamber of Commerce and Industry Chairman Park Yong-maan attended the banquet. The reception kicked off with a musical performance featuring South Korea’s traditional string instrument haegeum and okryugeum, a traditional instrument hailing from North Korea. The first song on the program was “Nice to Meet You,” North Korea’s most famous welcome song. It was followed by “From Seoul to Pyongyang,” a cheerful song wishing for the reunification of the two Koreas. The stage was then handed to young South Korean singer Oh Yeon-jun, who rose to stardom after singing the Olympic Anthem at the Winter Games in PyeongChang, Gyeonggi Province, in February. At Friday’s dinner reception, he performed a cover of “The Place the Wind Blows From,” a song by the late legendary South Korean singer Kim Kwang-seok. Following the performances, the South Korean president took to the podium to deliver a welcome message and a toast. 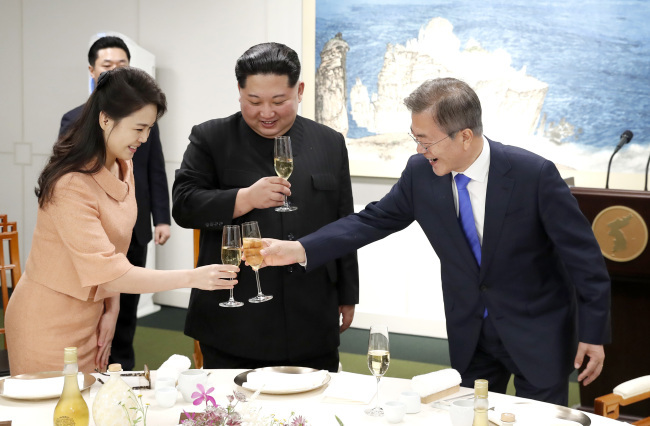 “I don’t know how they propose a toast in the North, but I will say, ‘To the day when the two Koreas can freely cross (each other’s territory)!’” Moon said, raising his glass. The North Korean leader reciprocated by expressing his gratitude to Moon in a speech, after which he clinked his glass with those of the South’s president and first lady. The dinner course featured a series of carefully selected dishes including Pyongyang naengmyeon, a cold noodle dish hailing from North Korea, prepared by the head cook from Okryugwan, the North’s most famous naengmyeon restaurant in Pyongyang. 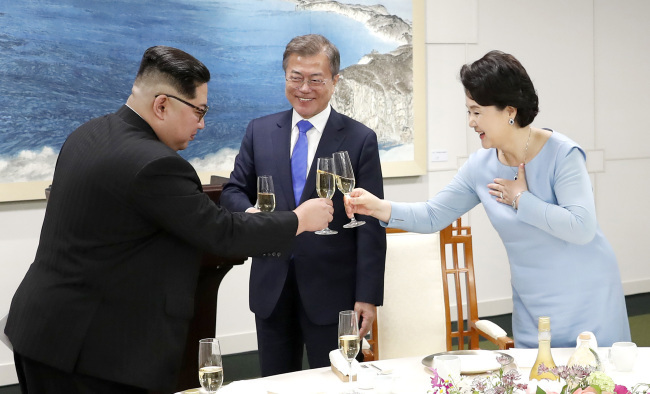 The meal finished off with the two leaders breaking a chocolate dome together while dessert was being served, Cheong Wa Dae said.